Previously diagnosed with AFib, the unnamed man was on blood thinners to correct the problem, but was ultimately cleared by doctors. While regular hospital monitoring showed normal heart rhythms, ECG readings from the man's Apple Watch Series 4, presumably taken at home, revealed irregular rates. After seeing the results, his cardiologist, Dr. Phil Massey of Pacific Medical Centers in Seattle, determined the AFib had returned and prescribed blood thinners to prevent a stroke, reports local news outlet KIRO7. Atrial fibrillation (AFib or AF) is an irregular heart rate characterized by rapid, irregular beats that can lead to heart failure or stroke. While there are sometimes symptoms, it can often present without -- as was the case for the man out of Bothell. "He had been off of blood thinner and he didn't know it had come back," Massey said. "When you have AF it can be intermittent so he could come into the office and be in normal rhythm. But then he could show me the tracking on his watch and show me that it had come back. And then we got him on a blood thinner to prevent a stroke, so that is a big deal." Massey was impressed with Apple Watch's functionality and remains optimistic that it can potentially save lives. "I am hopeful that other heart rhythm problems will be able to be detected in the future outside of the doctor's office, and that's exciting," Massey said. This isn't the first time someone was potentially saved by the ECG feature of Apple's latest Watch. A number of reports have highlighted the device's ability to detect AFib and other heart conditions since it launched in the fall of 2018. 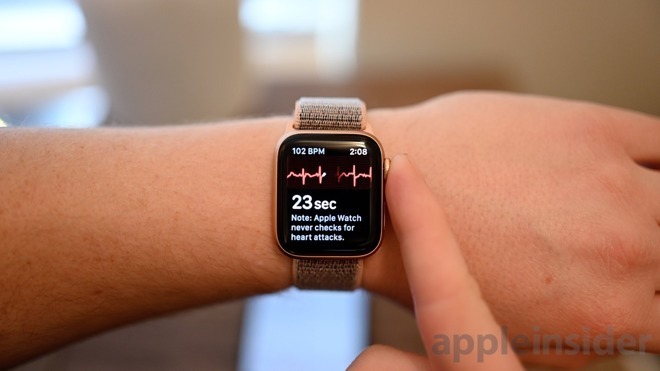 Taking an ECG with your Apple Watch Series 4 is easy to do and involves opening the ECG app and placing a finger on the Digital Crown for 30 seconds. Results will fall into one of three categories: AFib, sinus rhythm (normal) or inconclusive. 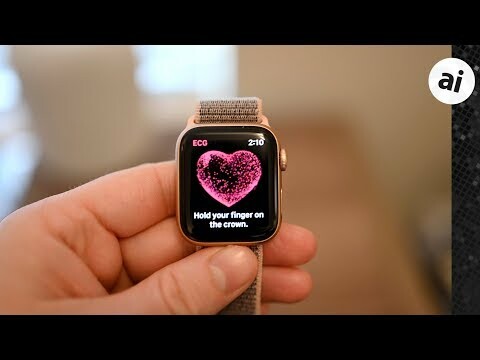 February also happens to be American Heart Month which Apple has celebrated with a series of exclusive events at select Apple Stores across the country. I find the Apple Watch to be a more amazing and wonderful product than anything Steve ever produced -- and I say that with enormous respect and gratitude for all that Steve did for our world. Increasingly the Apple Watch is morphing from a fashion trinket to a capable exercise/activity monitor to a health promoting tool to an essential safety device. It is that last that I'm not sure that even Apple comprehends: I have spoken to Apple Store reps about the watch and how it promotes personal safety and every time I was met with a "huh?" -- like the thought had never before occurred to them. But, one more aspect of that: My 12 year old grandson is increasingly in places without parental supervision and where he cannot carry his phone (like swimming or playing football with friends). So, today I have arriving for him a Series 3 with LTE (thanks to a great deal from B&H that I learned about here on ai). Now, he will be able to reach out for help wherever and whenever he needs it -- and his parents will be able to check in with him as needed -- so he can gain independence while remaining as safe as possible. Thank you Steve for creating the organization and the environment that made this possible! Apple Watch Series 4 also saved by Dad when it shows signs of AFib and the doctor was glad I took him immediately as soon as it showed AFib. The doctor put him on blood thinner medication to prevent a stroke. Still not available in the UK. Apple need to push the UK medical council to grant approval. People who claim ECG is a gimmick and useless, can you come out of your hiding for just one article? Especially those who say "doctors won't take a Watch seriously". Which is why uploading to iCloud automatically is a good idea. Had you had an android he would have just erase your phone. And doctors don't need to take it seriously. A medical grade, 12 lead EKG is a safe, cheap, simple, easy, non-invasive test for them to verify anything that the watch reports. They know that. EKG's are one of their front line tests. But but but false positives! Saving a life outweighs the inconvenience of false positives. Which is somewhat surprising. The US Food and Drug Administration controls this and they were actually somewhat fast to approve it, and without needing a prescription. Usually they take a very long time. Most ECG monitors aren't worn for long enough periods to catch AFibs that occur outside of their usual monitoring period of 1-2 weeks -- and the rental on those will usually pay for an AW4. It's good that the AW can be worn literally for years almost continuously. The US Food and Drug Administration controls this and they were actually somewhat fast to approve it, and without needing a prescription. Usually they take a very long time. I think the FDA was satisfied with the accuracy of the execution and felt the upside far outweighed the down side. Unlike a drug, there'd be no harmful effect on the wearer's biology. Glad you prevailed. What happened would be called battery and attempted strong arm robbery in most states. It's too bad he didn't get arrested, but you were able to walk away. I have Just Press Record and will have to check out your contingency plan. Siri seems a little hard of hearing on my S2. Of course if some jerk is yelling at you, that's a different story. Not just battery and ARM robbery - he was trying to take the camera, display, speaker, microphone and case too - in fact the whole damn phone! On a medical forum I am on, that was the only concern expressed -- although it was far from a universal concern. And, it wasn't simply a worry about a false positive but "Are we going to get swamped with a deluge of the worried well?" -- and the general consensus seemed to be "No". Admittedly, that is only one forum and it may not be representative. But, I have no reason to believe that it doesn't represent the majority. You did! You even went so far in your claims that it wasn't just useless but harmful and that a single-lead ECG wasn't a real ECG. LOL... I never said anything such thing. Stop trolling. Stop with the lies. They make you look stupid. We all are sad about the bad mediatic campaign against Apple. But we know how much amazing products Apple do. That man saved his life. This is true innovation. AirPods let forget about cable , Face ID with gestures without bottoms changed our way to interact with iPhone smartphone and iPad. HomePod change my way to ear the music and movies Apple TV . All of this , is pure innovation .